Tory force led by Col. Ferguson camped nearby Oct. 4-5, 1780. 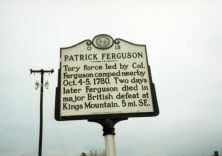 Two days later Ferguson died in major British defeat at Kings Mountain, 5 mi. SE. Patrick Ferguson was born into a wealthy family in 1744 in Edinburgh, Scotland. While still a teen, he was commissioned into the British army, seeing action in Europe during the Seven Years War. 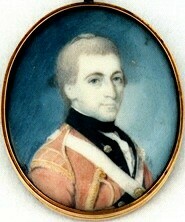 In 1768, Ferguson purchased a captaincy in the 70th Foot Regiment, a unit led by his cousin, Col. Alexander Johnstone. Ferguson served with the 70th in the West Indies until 1772, when he returned home suffering from leg ailments. Upon returning to Great Britain, Ferguson began experimenting with light infantry tactics and developed the Ferguson rifle, a breechloading weapon based on an earlier French design. After demonstrating his weapon to George III, Ferguson received permission to raise an experimental rifle company that deployed to America in 1777. Later that year at the Battle of Brandywine, Ferguson received a wound that crippled his arm. Tradition states that, during the battle, Ferguson had in his sights an American officer but refused to fire as the man had his back turned towards him. Ferguson reportedly later learned that the officer was George Washington. Little evidence exists to confirm this story, however, and it likely is apocryphal. By 1778 Ferguson had recovered from his wound and been appointed to the staff of Sir Henry Clinton. The following year he was appointed a major in the 71st Foot Regiment, with whom he took part in the siege of Charleston in 1780. During Cornwallis’s invasion into South Carolina, his Lordship appointed Ferguson commander of a Loyalist force and gave him orders to proceed into the backcountry to intimidate local Whigs and raise new recruits. In the second week of September, Ferguson camped at Gilbert Town and delivered a message to the backcountry settlements threatening to “burn them out” if they interfered with British policies. By early October, Ferguson forces were west of Charlotte, near the present-day town of Grover in Cleveland County. Unfortunately, his message had only angered the backcountry militia, who by October 4-5 were on his trail. Two days later, an army of militia from Georgia, the Carolinas, Virginia, and the backcountry caught up with Ferguson at King’s Mountain. In the ensuing battle Ferguson was killed and his small army of Loyalists annihilated.